The goal in delivering Flex ICE to the market was to make an extraction compound so complete that no other product would ever be needed. No matter what pre-spray is used, and no matter the carpet or upholstery fiber, Flex ICE leaves the fiber exquisitely clean and at a neutral pH. Since it brings down the pH, and doesn't leave a resoiling residue, the carpet will stay soft to the touch without a soapy residue feel. With a majority of professional cleaners using the Hydro-Force™ injection sprayer or similar devices, there has been a concern about an acid side pH rinse taking down the cleaning power of an alkaline prespray. Flex ICE has been tested and proven to not diminish the cleaning strength of the prespray when using a Hydro-Force sprayer. In fact, it is reported it actually adds to the cleaning ability. Flex ICE is actually good for your equipment. Not only will it keep hard water scaling from forming in the solution lines, it has special additives that protects steel, brass and copper. It has been tested over hundreds of hours of use with no deterioration to metals. Your dream cleaning emulsifier is now here! 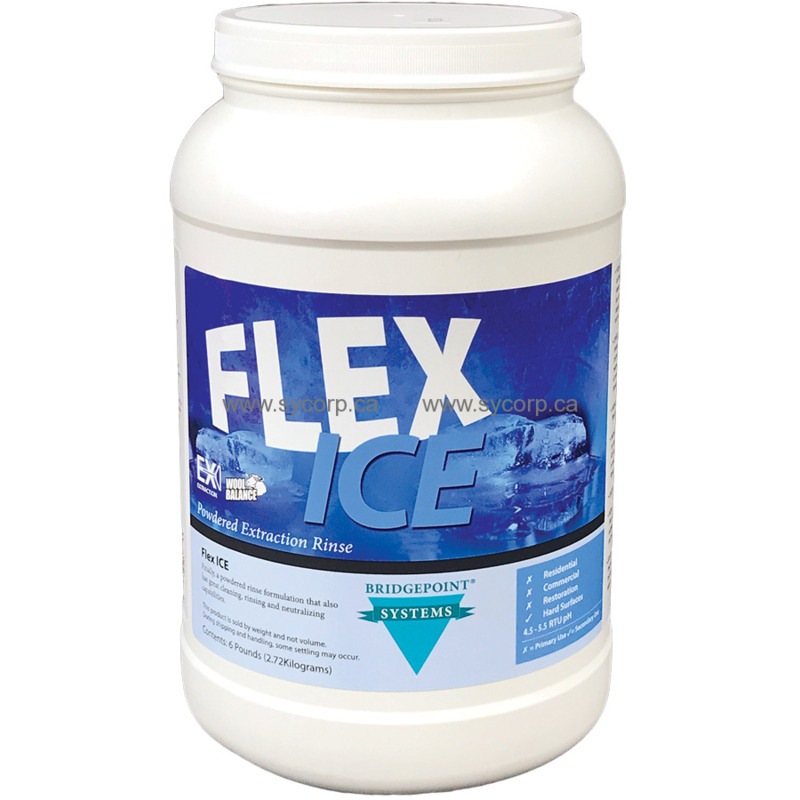 Flex ICE sets a new standard for best overall value of any rinse products on the market. HIGH CLEANING POWER - Flex ICE will surpass all other acidic extraction agents, while rivaling the cleaning effectiveness of the best alkaline formulas, due to its excellent soil suspension and removal capabilities. The result will be reduced cleaning times and very satisfied customers. EFFECTIVE NEUTRALIZING RINSE - Designed for free rinsing and cleaning with all pre-sprays, including high pH products like Flex Powder with Citrus Solv. This neutralization improves bonding and performance of protectors and reduces problems associated with browning, bleeding and resoiling. HIGHLY VERSATILE - Safe to use on all carpet and fiber types including wool. HIGH CONCENTRATE, LOW COST - When compared to other acid rinses, Flex ICE will save money. Flex ICE is a 100% active powdered formulation resulting in more carpets being cleaned at a lower cost than liquid rinses. EASY MIXING – Dissolves quickly in cold or hot water. NON-RESOILING - With the advanced formulation of Flex ICE, any remaining residue will not attract soil. EQUIPMENT SAFE – Flex ICE has special additives that help limit corrosion and buildup in the extractor or truckmount. It's actually good for your equipment. To be used as the primary cleaning agent, or as a rinse agent, in the extraction process for carpets and upholstery. Soft water is highly recommended. For truckmount concentrate: Add 1.5 to 2 cups Flex ICE to five gallons of cold or warm water. Mix thoroughly until dissolved. For residential carpet, set metering system to run at 2 gallons per hour. For commercial carpet, or heavily soiled carpet set metering system to run at 3-4 gallons per hour. For portable equipment: Use 1 ounce Flex ICE per 5 gallons hot water. Mix thoroughly until dissolved. For extra heavy soil use 2 ounces per five gallons of hot water. Excellent low ph acidic rinse to leave carpets and upholstery soft.